It looks like a wing, but it’s quite oddly shaped. The humerus is strongly curved and the humeral head is small with a very limited area for muscle attachment. This suggests that it wasn’t much use for flying – it also wouldn’t have been much use for swimming underwater or any other kind of locomotion for that matter. This narrows down the possibilities quite a bit. With these clues RH, henstridgesj and Lena all came to the same conclusion as I did – this wing is from a Kiwi Apteryx sp. Shaw, 1813. The Kiwi’s wing is tiny in comparison to its body and in the feathered animal it is all but invisible, hence the scientific name Apteryx which means ‘without wing’. Kiwis are incredibly odd. New Zealand has no native terrestrial mammals and birds have filled some of the niches that mammals normally fill. 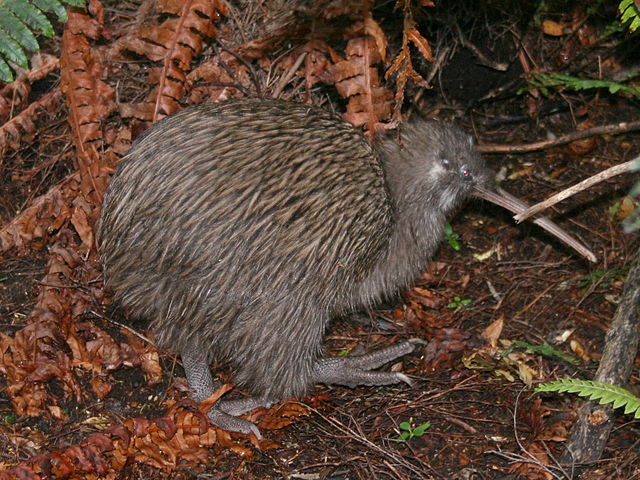 Kiwis are flightless, nocturnal, whiskered and they have an unusually acute sense of smell for a bird, which helps them find their invertebrate food – rather like a Badger or Hedgehog. Of course, by filling niches that mammals fill elsewhere, Kiwis are forced to compete with the mammals that have arrived in New Zealand alongside humans. Moreover, predatory mammals that would normally hunt other mammals are well equipped to take on Kiwis and changing land use is reducing the Kiwis’ habitat. This has led to several species of Kiwi being threatened with extinction. Not a great situation for our fascinating, furry-feathered friends.